At the FOMC, anything goes! Federal Reserve Bank of San Francisco President John Williams played down a “low” reading on second-quarter U.S. growth and said the economy could still warrant as many as two interest-rate increases this year — or none. “There’s definitely a data stream that could come through in the next couple of months that I think would be supportive of two rate increases,” Williams told reporters Friday after speaking in Cambridge, Massachusetts. “There’s data that we could get that wouldn’t be supportive of that — it could be one, maybe, or none. Time will tell. Dallas Fed President Rob Kaplan, who also spoke Friday, echoed Williams’ wait-and-see attitude, saying he wouldn’t “overreact to one data point,” particularly because the report showed consumer spending continued to be strong. For the past two years, both the nominal and real economy have been weakening. All the while, inflation has been “dead in the water”. US RGDP surprisingly disappointed today with just 1.2% QoQ annualised growth and, coincidentally, 1.2% YoY growth too. A lot of the weakness in real growth was due to perhaps noisy factors like inventories. 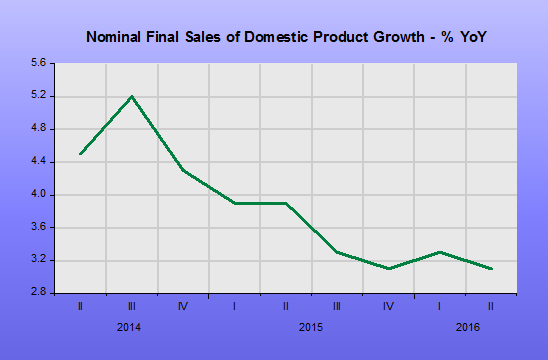 However, even final sales are weakening. 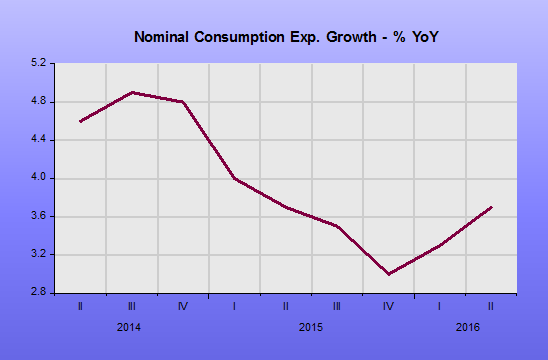 Household spending (PCE-Personal Consumption Expenditure) was also nothing exciting on a YoY basis at just 3.7%. 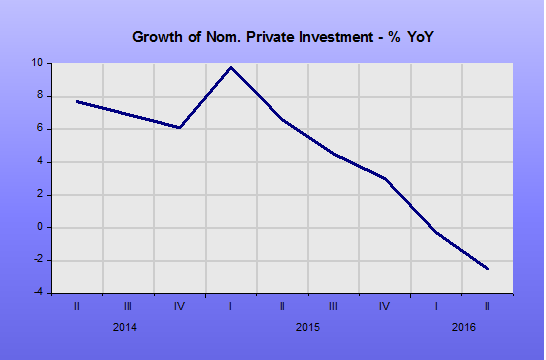 Investment growth is now in negative territory. 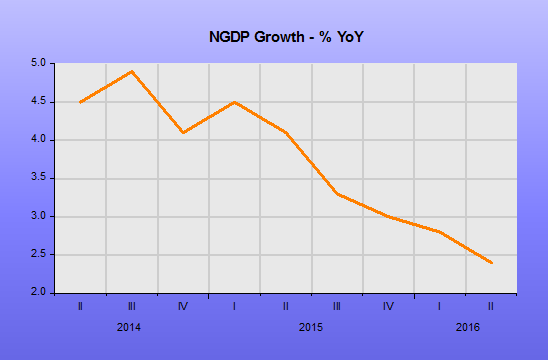 The main story of today’s release is the horrible NGDP growth print for 2Q. The trend is even worse than we have been worrying about. The second quarter YoY growth rate was a mere 2.4%. This is well below the near 3% being seen in the supposedly sick Euro Area. The charts indicate very clearly that since mid-2014, when the Fed began the on-off rate hike talk, nominal trends have been down. RGDP growth simply cannot blossom in such an environment. Many were laughing about the 2Q RGDP figure for France today, but at 1.4% YoY it has grown faster than the US for the last 12 months. The Euro Area as a whole did better than France, growing 1.6% YoY in the second quarter. 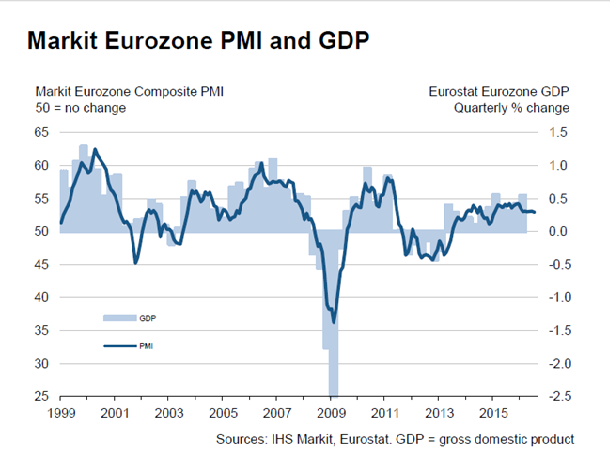 This isn’t a complete surprise to us who have been pointing out the better news from the Euro Area for some time. The reason is that monetary policy is so much easier in the Euro Area than the US. The ECB is on the front foot with Base Money growing at 40%+ a year versus negative 5% per year in the US. The FOMC statement today clearly tried hard to tell the market that the economy was improving, signaling the “door is open for a September hike”! 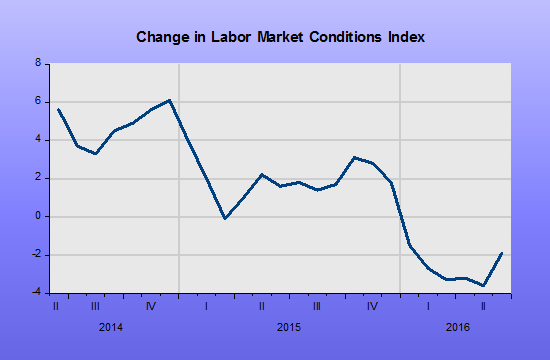 But … since mid-2014, the Fed’s own Change in Labor Market Conditions is still weakening, if a bit less than earlier in the year. Household spending in nominal terms is still awful, even if lowflation means real spending looks OK. NGDP growth is also sliding down. We know that money illusion means people certainly won’t feel better and low nominal growth does no favors to productivity growth. The Price Pressures probability, calculated by the St Louis Fed, also shows price pressure is absent. Today’s FOMC statement followed on from the transparent spinning we spotted last week by the Fedborg. In fact, three bits of data that came out today were all weaker than expected all in different areas of the economy: durable goods, pending home sales and stronger oil inventories. A “moderate rate” of expansion is just plain wrong. The markets certainly reacted quickly, first seeing a rise in the USD and bond yields before shock kicked in that the Fed had lost touch with reality and both the USD and bond yields fell. Technically the first impact is the liquidity impact of tighter money followed by the Fisher effect of longer term expectations driving prices. The feedback loop we identified in monetary policy seems to be working very quickly these days, hours, minutes. In fact, it is on the way to collapsing to a single point: “Whatever the FOMC says, there will be no tightening”! Daniel Tarullo: The Fed’s Market Monetarist? … if markets do regard economic prospects as only modest to moderate going forward, then raising short-term rates is almost surely going to flatten the yield curve, which generally speaking is not good for financial intermediation and in some sense could actually exacerbate financial stability concerns. So, as I say, I think the observation is a reasonable basis for paying more attention to financial stability issues, but it doesn’t translate into therefore raise rates and all will be well. It is worth stopping to think just how good is this answer. He thinks markets are well worth listening to about the economy. He’s humble about his own forecasting skills. He is almost suggesting that the Fed should be led by market expectations about the economy. Raising short term rates could flatten the yield curve. He’s almost saying that raising rates when the market thinks it inappropriate will lead to rates falling, especially at the long end at first, especially relative to the short end. And maybe lower rates at the short end too after a while. Raising rates too early, against the market, could lead to financial instability. He’s suggesting that raising rates to burst bubbles or whatever can cause the financial instability it seeks to prevent. HILSENRATH: You’re not worried about bubbles right now? TARULLO: Well, no, I’m not. I mean, there are always going to be asset prices that may be above historic norms. I think everybody should be a little bit humble about thinking you can identify in each market where a price is sort of out of line and think that you can then dial it back. What we should probably be looking at is to see whether, across a broad range of assets, first, prices are above—probably significantly above historic norms. But secondly, you know, when you’re thinking about financial stability, you really do want to look at how the assets are being funded because to the degree that there’s leverage, particularly short-term leverage, you’ve got greater risks. To the degree that there isn’t, there may be money lost if assets prove not to have the value that the market currently assigns to them, but that is the way a market economy is supposed to function. But I think my—I think it’s useful to give a little context here. I don’t think of this as a normalization process. You know, people sometimes write about it, talk about it, using the term “normalize” or “normalization.” And I don’t believe that there’s some target that the Federal Reserve should be moving towards. What the right level of interest rates is depends upon the manifold factors that are affecting the economy in the short term and over the longer term. So, for me, it is a judgment as to how—taking a pragmatic look at things, how we can best pursue the dual aims of maximum employment and price stability. Now, in current circumstances, what does that mean? Well, I think, first, it’s worth focusing on the maximum employment goal. The statute—the Federal Reserve Act says we’re to pursue maximum employment; not some abstracted concept of full employment, but maximum employment that is consistent with price stability. And I think, as we’ve seen, that even though—you know, for nine or 10 months now some people have said we’re at or close to full employment, and yet during that period we’ve created 800,000 or 900,000 jobs with the unemployment rate essentially stable, except for last month when the participation rate brought it down. That tells me that there was more slack in the economy. That tells me that we have the opportunity to create more jobs. That is obviously good for those 800,000 or 900,000 Americans. That’s almost surely good for those who are more on the margins of the labor force. It’s almost surely good for groups, like African-Americans and Hispanics, who traditionally have had higher unemployment rates. It’s neither the 1970s with a hot economy, and the Fed’s current tool set is biased towards tightening, not easing. So I look at this as an opportunity for greater maximum employment in a context, moving to the second point, in which inflation is not at our stated target, not near our stated target, and hasn’t been so in quite some time. This is not an economy that’s running hot. This is not the late ’70s. This is an economy that has been moving forward in a gradual recovery, modestly above trend for some time now, but as I said a moment ago surely not running hot. And it’s also an economy in which we probably are not actually providing as much stimulus as people may think. The neutral rate of interest has surely come down a good bit since the pre-crisis period, probably because of slower productivity, slower demographic growth, probably a bit because of the global environment. But for all those reasons, the neutral rate is lower, which means we’re not as far away. And finally I think, as many people have observed, the risks we face present us with an asymmetric set of tools. Were the economy to pick up more rapidly, which would be, I think, a welcome development, we have the tools to respond appropriately. But were things to slow down, we obviously would face a more limited set of tools. 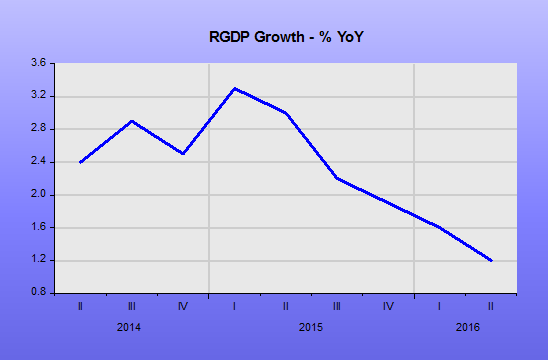 UK RGDP in 2Q 2016 surprised on the upside today with 2.2% annual growth. 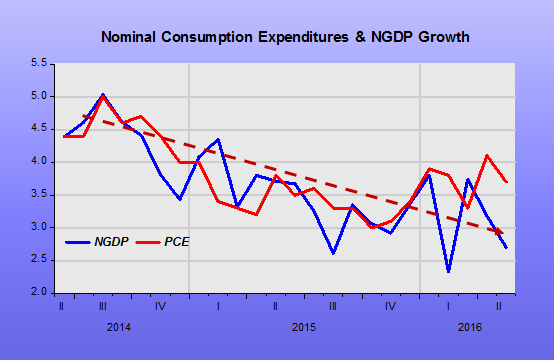 NGDP also picked up a bit to 2.9%, but is still well below trend. The numbers are only a first estimates, and there has been some funny business with a usually strong April following a very weak March. In any case no-one is that interested in 2Q as it is all pre-Brexit. No-one will be that interested in 3Q probably either as it will be influenced by the shock of the Brexit vote. We are also not that interested in RGDP as it is such a low quality number, based on the neglected numbers that go to make up NGDP and the low quality GDP deflator figure that, like CPI, struggles to cope with qualitative and structural change. 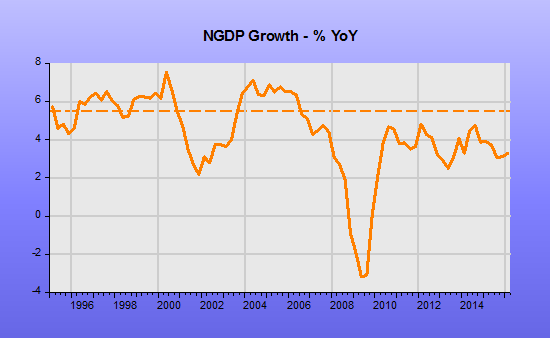 NGDP in the UK has been horribly weak for the prior four quarters. 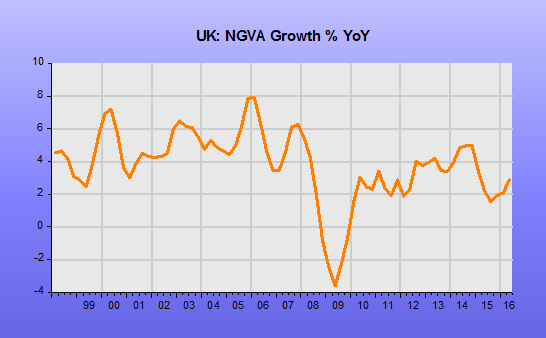 The proxy number for NGDP, Nominal GVA, has been even weaker at a less than 2% average over the last four quarters. While the 2Q 2016 figure of 2.9% is better than the recent past it is still far below a healthy level. Only NGDP growth and hence wage growth of around 5% will allow real incomes to show a good diversity of outcomes and thus promote flexibility and productivity growth. Real wages are still squashed down into a narrow range of growth by this nominal sluggishness. A top priority for the new Chancellor of the Exchequer is to give the Bank of England nominal growth targets for the good of the economy overall and for healthy tax receipts in particular. Higher nominal growth will also enable the UK labour market to cope with (potential) shocks from things like Brexit, allowing aggregate negative real wage growth without having to go through job and wealth destroying process of aggregate negative nominal wage growth. How long is “too long”? Practically no one believes that the Fed will raise interest rates after its July meeting this week, but some Federal Reserve officials, such as Atlanta Fed President Dennis Lockhart and Dallas Fed President Robert Kaplan, are suggesting that rates could go up in September. With Fed Chair Janet Yellen constantly putting off rate increases, no one can be sure what will happen in the fall — even if the jobs reports for July and August are as rosy as the 287,000 June jobs increase. The unemployment rate stands at 4.9 percent, and the latest inflation data show that the Consumer Price Index rose by more than 2 percent over the past year. The Fed should not depend on employment data, which will be revised several times, to decide when to raise rates. Rates have been too low for too long, and it is time for them to rise — regardless of what the jobs report shows. 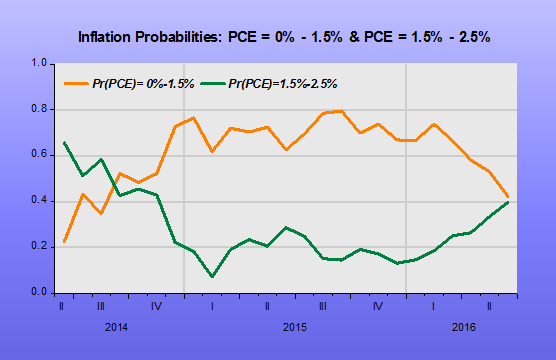 The longer the Fed leaves rates low, the greater the danger of inflation. Levels of inflation depend not only on interest rates set by the Fed, but on the willingness of banks to lend. It is difficult for the Fed to forecast a precise level of inflation and stick to it because its models are imprecise across a multitude of economic measures. The Fed and the IMF regularly overpredict GDP growth, and in 2007 their models did not forecast the recession. Western economies’ experience of inflation in the 1970s and 1980s showed that eliminating inflation is no easy feat. The world does not need another bout of stagflation. Interestingly, to a New Fisherian such as Steven Williamson, the danger of rates too low for too long is deflation! We know that, for almost eight years, while interest rates have been extremely low, inflation has been locked inside the 1%-2% range, and shows no sign of “escaping”, either to the “north” or to the “south”! What´s behind the low inflation AND low real growth is the low LEVEL and low growth of NGDP! My forecast is that the Fed will remain reluctant to raise rates until inflationary pressures are much stronger, at which point it will feel compelled to move at a faster pace than four times per year. This is similar to Chicago Fed President Charles Evans’s suggestion that the central bank should wait to raise rates until core inflation reaches 2 percent. If prices start rising at that rate, the Fed will be right to put a lot more weight on inflationary concerns than on downside risks. Charles Evans’ suggestion has been practiced in the past. The Committee judges that, on balance, the risk of inflation becoming undesirably low is likely to be the predominant concern for the foreseeable future. In these circumstances, the Committee believes that policy accommodation can be maintained for a considerable period. With inflation quite low and resource use slack, the Committee believes that it can be patient in removing its policy accommodation. With underlying inflation still expected to be relatively low, the Committee believes that policy accommodation can be removed at a pace that is likely to be measured. 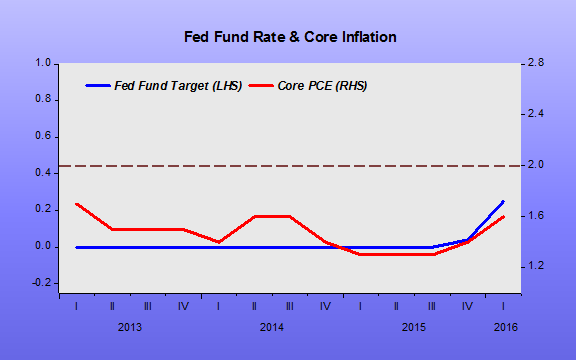 The FF Target rate started moving up when core inflation reached 2%, just like Charles Evans suggests at present. Unfortunately, at present, the environment is very different. Today, NGDP is way below the original trend level, in which case, even if (big if) inflation is brought closer to 2%, the level of nominal spending will still remain far below any reasonable trend path. To “ignite” the economy, and lift it from the depressed state it´s in, the best alternative is not to keep “fiddling” with interest rates, but to change the target to an NGDP Level target. 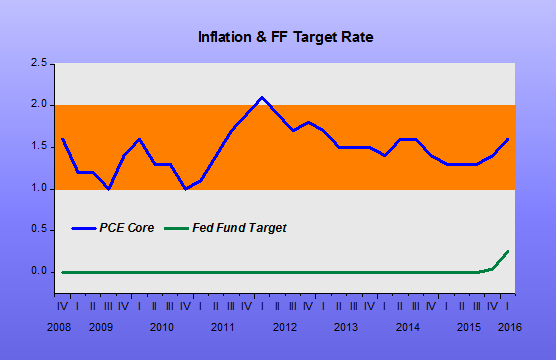 Those who argue that the U.S. Federal Reserve should keep interest rates low typically point to the same piece of evidence: The central bank’s preferred measure of inflation remains below its 2 percent target, suggesting that the economy still needs stimulus. What they ignore is that during the dot-com and housing booms of the 1990s and 2000s, this logic would have led to bigger bubbles — and bigger busts. That´s the best argument against inflation targeting! In the late 1990s and early 2000s, the economy was buffeted by (positive) productivity shocks. That increases RGDP growth and reduces inflation. If the fall in inflation induces the Fed to adopt a more expansionary monetary policy, the result will be nominal instability. But those were not straightforward times. Other relevant shocks were taking place. There was the Russia/LTCM shock of 1998, the oil shock of 1999 and Y2K (1999), terrorist attack (9/11/2001), the Eron et al also in 2001. In 2003-08 there were also back to back significant negative oil shocks. Instead of gauging the stance of monetary policy by the up´s and down´s of the Fed Funds rate, you should look at the behavior of NGDP relative to trend. 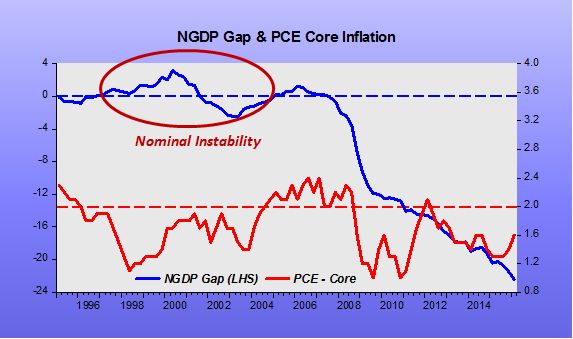 The chart puts the NGDP Gap (the behavior of NGDP relative to its trend path) and PCE Core inflation. It seems that in its reactions to those shocks, the Fed initially “oversupplied” money between 1998 and 2000 and then, “undersupplied” money between 2001 and 2003. During most of that period, inflation remained below “target” because the positive supply shock was preponderant. The bursting of the subprime bubble was particularly disastrous, forcing the Fed and Congress to take extraordinary measures to keep the financial system afloat and contain the economic damage. One can only wonder how much worse the episode would have been — and whether Congress would have found the political will to pay for even bigger bailouts — if the Fed had further fueled the boom by conducting even looser monetary policy. We should be glad the bubble got no bigger than it did. He couldn´t be more wrong. What happened is that with the end of the productivity boom and the reemergence of a strong negative supply (oil) shock, core inflation ticked above the then implicit inflation target between 2005 and 2007. But that was enough to bring on the inflation paranoia, which is quite evident in the 2008 FOMC Transcripts. 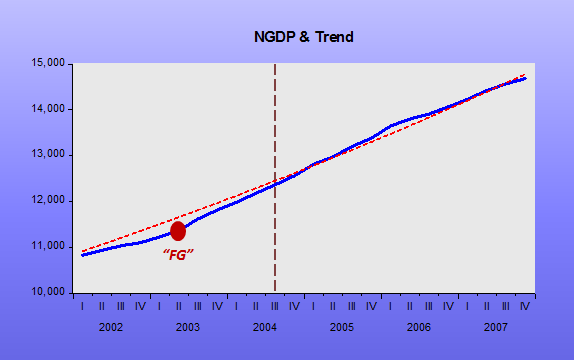 The result was that in 2008 monetary policy was severely tightened, with NGDP taking a deep and prolonged dive. Now, you could ask: Why didn’t inflation become deflation? It certainly was on the way to that, but in 2009 the Fed reversed course and put NGDP growth back into positive territory. The chart illustrates. 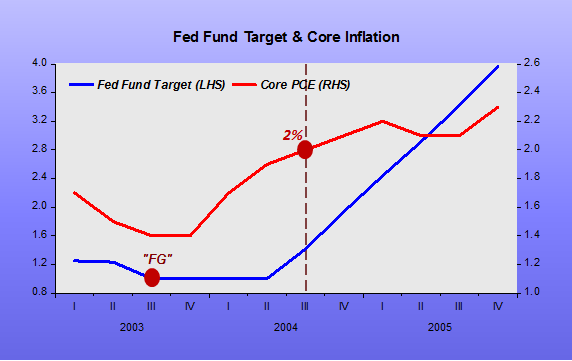 Something interesting to note: Since the crisis, core inflation has not behaved differently from what it did during 1997-2004, remaining mostly below target. The difference is that now, instead of a productivity boom, we´re having a productivity slump. Inflation should be higher. 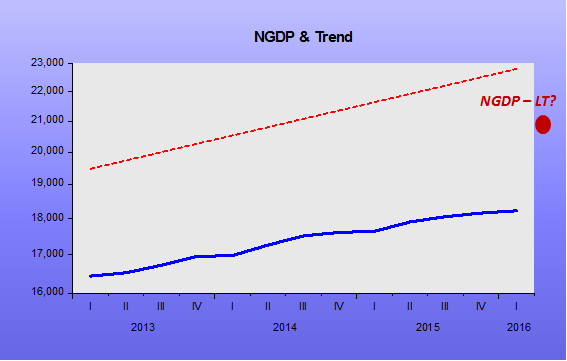 It isn´t because NGDP growth has remained on a much lower path than before. However, likely because the NGDP level path has been so much lower, opportunities for productivity enhancement investments have been rare. This has important feed-back effects and may be the main reason for the appearance of “feelings” of “Great Stagnation”. 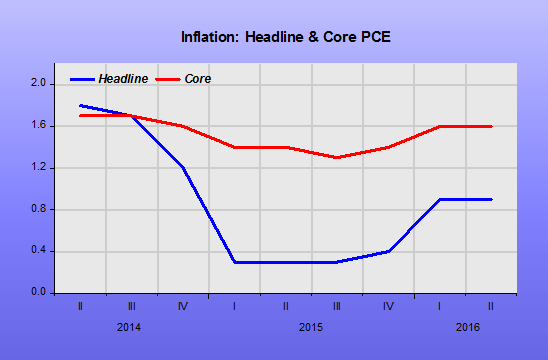 Of course the Fed has to focus on inflation in making its monetary policy decisions. But officials should keep in mind that core PCE is not the only measure, and factor in other indicators such as employment and the behavior of asset markets. If they do so, the case for removing stimulus in the near future will look a lot stronger. 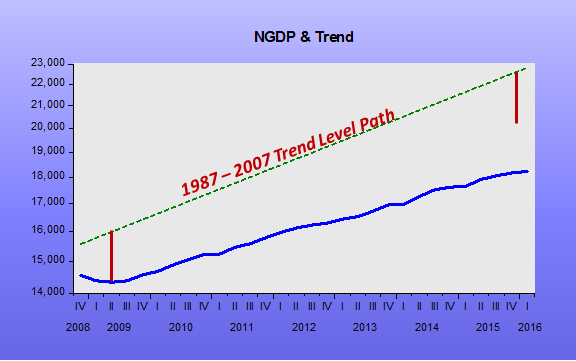 Life for the Fed and for the market would be much simpler if, instead of an elusive “inflation target”, the Fed targeted a trend level path for NGDP, much like it implicitly did from 1987 to 2007.